In this lesson you will learn how to solve systems of equations. Systems of equations usually have 2 equations and two variables. You can solve a system of equations by using one of the following methods. Let’s consider the same system of two equations and solve it by using each of the above methods. The graph of the first equation is the red line, and the graph of the second equation is the blue line. 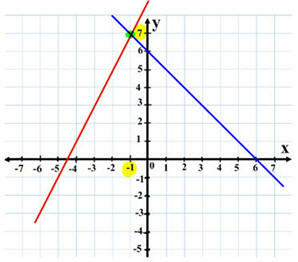 The x-coordinate of the point of intersection between the two graphs is x = -1 and the y-coordinate is y = -7. Therefore the solution of our system is x= - 1, y = -7. This method consists in expressing one variable in terms of the other one. In the second equation, x + y = 6, we can isolate x by subtracting y from both sides of the equation. Replace x with 6 - y in the first equation. Divide by - 3 on both sides. To find x, return to x = 6 – y and replace y with y. Add the two equations to eliminate y. To find y replace x with -1 in the second equation. Return from the Systems of Equations page to Algebra Videos or to 8th Grade CRCT Math.